Great family house, Goodwood, Harbour village, Beaches, low midweek rates. Enjoy our family friendly midweek prices. Family gatherings, groups of friends, business travel and romantic breaks. Beaches, Goodwood, Roman City, Sailing, Surfing, Windsurfing, Fishing, Boat trips, Birdwatching, Walking, Swimming, Horse and Motor Racing, Horse Riding, Cycling, Restaurants, Bars and Cafes. Chichester and surrounding has so much to offer. We try and offer families a place where they can relax and enjoy without bringing too much stuff. Ask us for more details but we provide on request high chairs, travel cots, toys and games, a cool box for the beach, buckets and spades and a paddling pool in the garden. Cornerstones is located in the heart of the village of Birdham. A peaceful location 10 minutes walk from Birdham Pool, 2 minutes from the village cricket ground and Church. Birdham is the perfect location to enjoy the beautiful Chichester harbour, Birdham Pool, West Wittering Beach and Chichester Marina. The marina is popular not just with the 'boaties' and 'yachties' but with walkers and cyclists who call into the Boathouse Cafe which opens at 8am for breakfast through to dinner in the evening. Take a lovely walk across the fields following the harbour to Itchenor and The Ship Inn which has an extensive menu, and during the colder months 2 cosy open fires, quiz nights and mulled wine. From mid May until the end of September daily, and April to October weekends and bank holidays, Andy the ferryman takes people, bikes and dogs over to Bosham on the ferry. It costs £2.50 each way for adults, £1 for children and 50p for bikes, dogs go free. The beautiful sandy beaches of West Wittering are about a 10 minute drive or a 30 minute cycle ride away along the Salterns Way. The Salterns Way is a cycle route that stretches from the centre of Chichester to the sand dunes at East Head. We are very lucky that this cycle route passes right through the village which makes family cycle days easy and so much fun. We would highly recommend that you take advantage of the cycle routes to really make the most of your stay so either bring your bikes or hire them from our local cycle hire shop just around the corner. Goodwood and all it has to offer is a 20 minute drive away at the foot of the Southdowns. About the property, Cornerstones is a 5 bedroom home with 2 large double bedrooms and a bathroom on the first floor and 3 smaller double bedrooms, a bathroom and a 3rd toilet on the ground floor. The light, bright open plan kitchen dining room has a full sized fridge and freezer, dishwasher, microwave and AEG oven and hob as well as a tumble dryer and washing machine. The dining area has a large farmhouse style kitchen table which can seat 10 people, there are also 2 high chairs available on request. The kitchen overlooks the garden which has a Weber BBQ and outdoor furniture and is perfect for relaxing in on hot summer days. There is a chiminea for those chillier evenings and we provide bankets for cuddling up under maybe with a hot chocolate and some toasted marshmallows. The house is gas centrally heated with a new boiler and a central thermostat. The lounge has a wood burner and we provide logs for guests during the winter. If you have wet clothes, life jackets etc, there is a large airing cupboard with a hanging rail perfect for drying. There is plenty of hot water. The largest of our bedrooms has a kingsize bed, 2 bedrooms have double beds and TVs, one of the bedrooms has a daybed with trundle which will be made up as two singles on request and bedroom 5 has 2 singles. All of the rooms have hanging space and hangers. Both bathrooms have over the bath showers. We are keen on making sure your stay is as comfortable and stress free as possible. For that reason we provide children's cutlery and plates, stairgates and 2 travel cots. The two first floor bedrooms are large and able to accomodate the travel cots or trundle beds if you require them for extra guests. Extra guests cost £25 per person per night. We just love being by the water. Arnie loves his boats and couldn't be more than a few minutes walk away from one of them. We love to drag our kayaks onto the harbour and go for an early morning paddle. We take our little dog Buddy with us and occasionally get to see a seal! We love cycling and where we live is perfect as we live on the Salterns Way. We have 7 children and 3 grandchildren between us and they have all been brought up in and around the water. We are real foodies! If you want to know where to eat or where to get a great coffee we are the people to ask. Walking is something we do a lot of. We love the coastal and harbour walks locally and when we get a chance we head to Cornwall or the Lake District, two of our favourite places. Location, location, location. We wanted to live in the heart of this beautiful village and over the years have owned 5 properties here between us. We chose this particular property as it is light and bright and light is so important to us. All of the rooms are filled with sunshine on sunny days. There is lots of sky, trees, and peace. 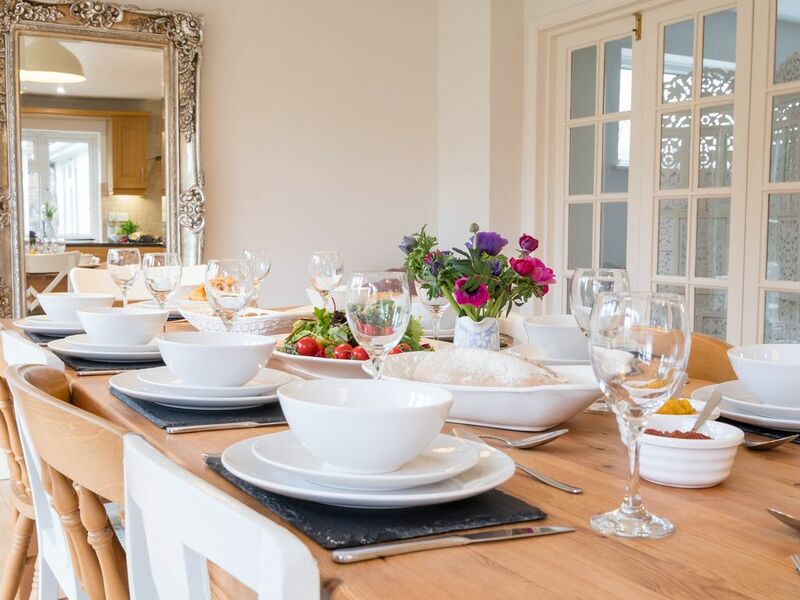 Situated in the Harbourside village of Birdham that is within the Chichester Harbour AONB. Our house has space for 10 people, light bright kitchen diner and spacious yet cosy lounge with a wood burner. The garden is well maintained and is a good size for families and secure for children and pets. High quality bed linen provided. Parking for up to 4 cars on the drive. We provide 2 towels each plus a hand towel in each of the bathrooms. We have a stock of chopped wood which we are happy to provide in the colder months. There is enough seating for 10 adults. New 2016 Bosch 12 place dishwasher. We have a large full size fridge and a full size freezer. Gas hob with 5 burners one with a Wok ring. We have an AEG electric double oven. Yes we have a microwave. We have a 4 slot toaster. We have a good range of cooking utensils and also include baking tins if you fancy an afternoon of baking. Fully fitted with plenty of work tops and storage with good quality equipment, a bright sunny room that faces South and East. Overlooking the south facing garden a bright and cheery room with a long solid wood dining table and ten chairs. large 3D HD TV with cinema surround sound, remote and Netflix. Use the dvd to play the radio or CD's in Stereo. Please brows the books that are in the house. A selection of board games available for all the family. There are a few baby toys including a train set and play mats. Some larger toys are kept in the log cabin. There is a large range of DVD's. Pop down to the log cabin and have a go on the xbox 360 there are several games or bring your favourite. lovely and sunny and private, overlooking the garden. Really lovely accommodation which felt like a home from home. Well equipped and a great garden for the children to run around it and adults to enjoy the sun. Only disappointment was the dishwasher was out of action which, with 6 adults and 6 children, resulted in a lot of washing up. Will definitely consider for a second trip. We are so pleased you enjoyed your stay at Cornerstones and so sorry the dishwasher wasnt working! The engineer finally arrived on Tuesday and fixed it. We do hope you will come and stay again and thank you for being such great guests. The house is great, the owners try to think of everything to make you comfortable. When we arrived there were various treats waiting for us, stuff for the kids to do and for the adults to eat and drink. The house is beautiful, well set out, very comfortable. Andrea and Arnie have tried to think of everything to make you comfortable, to include all basic supplies and kit or the kitchen so you can cook, bake, and eat with everything you need. We needed an extra sheet and Andrea was with us before i could even check my email for a response. The little lodge in the back garden was a great breakout space for the kids to play, and for one of us to watch the football. The owners couldn't have been more helpful with advice on what to do locally. Kids toys and kids table were great touches too. We are so pleased you found the house well equiped, we try and cater for foodies and families so that everyone can relax and have fun. Along with the beach we hope you managed to get to some of the other great places localy. Please come back and see us again and thank you for taking the time to post the review. Loved our time here. Great house and great hosts. Spent a week here over New Years with a group of 12 including 3 children. The house was perfect. Plenty of space for everyone with a huge kitchen and dining room, cosy lounge and very spacious bedrooms. The house has everything you could ask for. We have stayed in a lot of holiday homes and this would be the one that ticks all of the boxes. Would love to come back in summer to make the most of the garden. Andrea and Arnie were great hosts, responding quickly to any enquiries and leaving a very generous welcome hamper. Would highly recommend. Thank you for your great review and we are so pleased you had a lovely time at Cornerstones over the New Year period. Yes please come back and see us in the summer, the garden is beautiful when its full of colour and a great space for the children to play in as well as for everyone else to relax and enjoy a bbq or 2! We are a three generation family of ten spending Christmas at Cornerstones for the second time. We knew it would be a magical experience, Andrea & Arnie go the extra mile to provide a warm & inviting home with every detail catered for. A welcome hamper full of festive goodies was enjoyed by all. Apart from enjoying the festive period at Cornerstones,we walked to the Harbour, enjoyed two walks on West Wittering beach and visited the lovely area of Bosham. Our last evening was spent enjoying dinner at the Crown & Anchor pub at Dell Quay. We very much hope we can return in the future. Its an absolute pleasure hosting you and your family. Its lovely to hear that you enjoyed walking on our beautiful West Wittering beach aswell as making the most of some of our local pubs. It would be lovely to welcome you back next time. Beautiful, Clean, Comfortable House equiped with everything you could need! We had an absolutely lovey stay at Cornerstones. We are a large family of 9 adults 3 and children under 2yrs. We were looking for somewhere to celebrate Christmas together. This home offered us plenty of space, a great location for getting into town easily and peace and quiet when we needed it. The house itself is gorgeous and incredibly well equipped with everything from stair gates and kiddies toys - to a Fab coffee machine, brilliantly equipped kitchen And NOW TV. Beautiful generous hamper on arrival too! We would love to stay here again and highly reccomend this house to anyone looking for a place to stay that will offer you a home from home to relax. Very clean, comfortable and well equipped holiday house. It had everything we needed and more. We were welcomed with a very generous basket of goodies and milk in the fridge too. Beds were very comfortable. Enjoyed beautiful walks around Chichester harbour. Would thoroughly recommend staying here. Birdham is a village on Chichester Harbour an area of outstanding natural beauty, at the top of the Harbour is Fishbourne Roman Palace and the Roman City of Chichester with a beautiful Cathedral and World renown Chichester Festival Theatre. The Goodwood Estate is just to the East of Chichester where The Festival of Speed, The Goodwood Revival meeting, and Glorious Goodwood racecourse are located.The Weald and Downland Living Museum is at Singleton just the over The South Downs from Goodwood and next to it is West Dean Gardens and Collage that host several events each year including the Chilli Fiesta, Mothers Day, Easter trail and more. At the bottom of the harbour is West Wittering's Blue flagged Beach and the stunning National Trust Dunes at East Head that all overlook the Harbour entrance and the Eastern Solent. all the above are essential attractions in the Birdham Area.